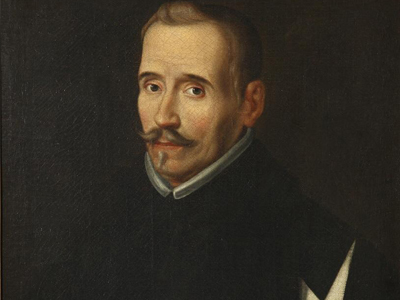 The works of a renowned playwright and poet of the Spanish Golden Age will be the focus of a daylong event this month. A symposium titled “Lope de Vega and the Early Modern World (1580-1635)” will take place on Friday, April 22, in the Peter Graham Scholarly Commons (room 114) of Bird Library. The program, which is free and open to the public, begins with a breakfast reception at 8:30 a.m. For more information, contact Alejandro García-Reidy at agarci07@syr.edu. The symposium is presented by the Department of Languages, Literatures, and Linguistics (LLL) in the College of Arts & Sciences in honor of the 70th anniversary of the journal Symposium: A Quarterly Journal y Modern Literatures and of the contributions to LLL by Harold G. Jones, Professor Emeritus of Spanish. Alejandro García-Reidy, event organizer and assistant professor of Spanish, says re-examining Lope reveals how he helped set the stage, so to speak, for modern theater. The timing of the symposium coincides with worldwide celebrations of two of Lope’s contemporaries: William Shakespeare and Miguel de Cervantes. Lope’s death in 1635 was mourned throughout Spain. A prolific and exalted writer, he penned nearly 600 plays and hundreds of poems, novels and short stories. Veronika Ryjik, associate professor of Spanish at Franklin and Marshall College. In addition to opening and closing remarks (at 8:30 a.m. and 3:40 p.m., respectively) the program includes formal presentations between 9:30 a.m. and 12:30 p.m. and 2 p.m. to 3:40 p.m.